Posted on Thu, Jul 30, 2009 : 3:36 p.m.
Twitter can be a useful tool. I've been using it to teach, alert and explain about local wild foods and opportunities for foraging and making herbal medicines. For those who prefer a nice old fashioned blog (is that possible?) I'll summarize the tweets here on a regular basis. Here are some of the things I've been tweeting about, with a bit more detail than I can add on Twitter. For lunch: purslane stir fried with tempeh, garlic, and greens with a bit of tamari and Thai hot sauce at the end. I found a purslane hot spot! Purslane is an amazing weed. 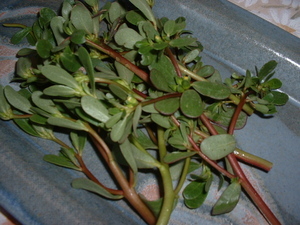 Many people are unaware that purslane, Portulaca oleracea. may be a common garden weed but is one of the richest sources of omega 3 precursors in the plant kingdom. It has a benign taste, and the fat succulent-like leaves are easy to add to salads or as a garnish to other foods. Not available in stores, it is enjoyed in season fresh from the garden as long as it is actively growing. One hundred grams of fresh purslane leaves (one serving) contain about 300-400 mg of 18:3w3; 12.2 mg of alpha-tocopherol; 26.6 mg of ascorbic acid; 1.9 mg of beta-carotene; and 14.8 mg of glutathione. For more information on the anti-inflammatory affects, I have an article on my web site that was originally published in The People's Food Co-op Newsletter. Yesterday I “captured” jewel weed seeds, and they were a mild nutty taste treat. Hold your hand around the exploding seed pod & trigger it. I blogged a whole article on this truly wild food. Those lovely honeysuckle berries you’re seeing everywhere? Most are toxic. Don’t eat them. St. John’s wort is known for depression; it’s a powerful nerve healer and also antiviral. Perfect for shingles - nerve pain from virus attack. St. Johns Wort showed up in my yard, I picked it, and tonight I have a shingles attack. SJW is the best remedy for me. SJW oil topically. My friends are reporting in - black raspberry season is over in this part of the woods. It was a great year for them! All years are different. These are not to be confused with blackberries, which are still coming in strong, as are mulberries much to my surprise. Found a small patch of St. John’s Wort at my lake cabin. Picked flowering tops 2 tincture. Photos and a whole article are up now! My favorite black raspberry patch had two ripe berries only. I fear the season is finally over. Always a sad moment. Linda Diane Feldt is a local holistic health practitioner and herbalist, "providing an integrated approach to holistic health care since 1980". Follow her on twitter, or check out her web site. She will be blogging for annarbor.com about three times a week. 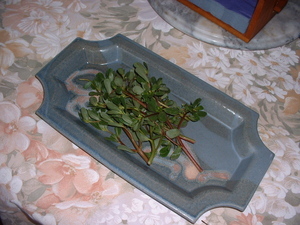 Photos of purslane by Linda Diane Feldt, picked from a garden on Jewitt Street. Fri, Jul 31, 2009 : 3:34 p.m. Thanks for the information, once again. I shall pursue the purslane article, as I have inflammation issues and would love to find something natural that will help to alleviate them. Thu, Jul 30, 2009 : 8:24 p.m.
Thu, Jul 30, 2009 : 6:09 p.m. The weed in your picture is called "" in my native language of Chinese. I ate lots of them when I was a kid and I like them.